Baton Rouge, LA – October 9, 2012 - Lamar Advertising Company (Nasdaq: LAMR), a leading owner and operator of outdoor advertising and logo sign displays, today announced that its wholly owned subsidiary, Lamar Media Corp. (“Lamar Media”), intends to redeem an aggregate of $66,099,000 of 6 5/8% senior subordinated notes consisting of (i) $36,099,000 of its 6 5/8% Senior Subordinated Notes due 2015—Series B (CUSIP No. 513075AP6) (the “Series B Notes”) and (ii) $30,000,000 of its 6 5/8% Senior Subordinated Notes due 2015—Series C (CUSIP No. 513075AS0) (the “Series C Notes”). Following the redemptions, there will be there will be $71,188,000 in aggregate principal amount of Series C Notes outstanding and no Series B Notes outstanding. The redemptions will be made in accordance with the terms of the indentures governing the Series B Notes and the Series C Notes, respectively, and the terms of the notices of redemption. Lamar Media expects the Series B Notes and the Series C Notes (collectively, the “Notes”) to be redeemed on November 8, 2012 (the “Redemption Date”) at a redemption price equal to 101.104% of the principal amount of outstanding Notes, plus accrued and unpaid interest to, but not including, the Redemption Date (the “Redemption Price”). The Redemption Price will be due and payable on the Redemption Date upon surrender of the Notes. A notice of redemption is being mailed to all registered holders of the Notes by The Bank of New York Mellon Trust Company N.A., the trustee for the Notes.Copies of the notice of redemption may be obtained from The Bank of New York Mellon by calling 1-800-254-2826. 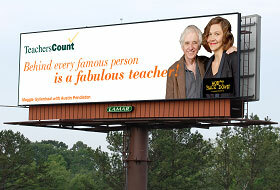 Just in time for back to school, Lamar Advertising Company and TeachersCount are teaming up on an ongoing basis to recognize teachers and highlight the impact that educators have on their students and on our country.